Note: Sunshine at And the Pursuit of Happiness is having a contest for a free fabulous garment from Sunshine's Designs. To enter the contest, you need to leave her a comment on her June 29th entry by Monday, July 2nd. Hurry over to read the entry and to enter the contest. Daddy D and I have arrived home after a quick trip to the east coast. Before our trip began, we had three goals in mind, to visit Thomas Jefferson's home, Monticello, to go to the Mariner's Museum to learn more about the Monitor and the Merrimack, and to see the place where the Wright Brothers successfully invented and flew the first airplane. After seeing these three historic sites, Daddy D commented that we had experienced three different eras of history. Monticello was built during revolutionary times and in the early days of United States history. The Monitor and Merrimack, were ironclad ships of the Civil War. The Wright Brothers flew made their historic flight at the beginning of the twentieth century. You might wonder why we chose to visit those specific sites with so many other places to choose. In addition to being of important historical significance, each of those sites are of scientific importance. Thomas Jefferson , in addition to being a prominent statesman, was a scientist. According to the Monticello tour guide, Jefferson was the nation's first meteorologist, with a keen interest in weather. Furthermore, he owned a number of interesting gadgets including a polygraph, a machine that made copies as he wrote letters and other documents. These pictures show a wind vane at Jefferson's home. 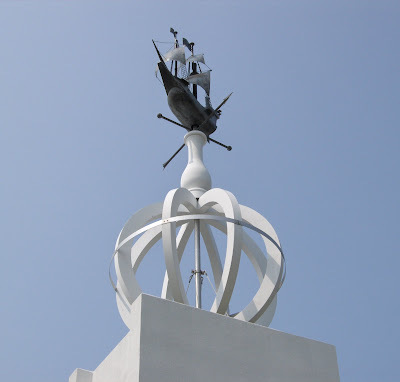 He had a traditional wind vane on the roof with the directional compass attached to the wind vane on the ceiling beneath the vane. We loved this history and science oriented vacation, but we like trips to state and national parks as well. One summer we were fortunate to stay at all of the state parks with lodges in the state of Indiana. On these trips, we hiked, and I photographed wildflowers. What is your favorite kind of vacation? Do you enjoy visiting monuments? Do you prefer an action-packed vacation of whitewater rafting or skiing? Would you rather lay out at the beach and soak in some rays while listening to the gentle swish-swishing of the waves? Or would you rather head to New York, London, or Sydney for days of shopping and nights of theater and fine dining? Tonight may be our last night away from home. After much discussion about which route to travel, Daddy D and I have started our trip home. We finally decided to travel through Virginia instead of North Carolina. Currently, we are in Beckley, West Virginia deciding whether to return home through Kentucky, or to go through Ohio to Indiana. Either way, we will be home by the end of the week. Looking back on these few days, we have had grand although quick vacation. One on our stops on the Outer Banks was the Currituck Lighthouse. This brick lighthouse stands majestically on the northern part of the Outer Banks. Arriving in North Carolina yesterday was somewhat tedious as the traffic from Virginia was horrendous. However, after a good night's rest, Daddy D and I were refreshed for our visit to the Outer Banks. We began the events of the day with a visit to The Wright Brothers National Memorial, where the two brothers made their historic flight. We have had a fine time on our trip; however, tomorrow, we need to begin the journey back to Indiana. After visiting the Mariner's Museum in Newport News, Virginia today, we traveled to our motel in Plymouth, North Carolina. One of the highlights at the Mariner's Museum is the replica of the Monitor and the actual raised turret of the ironclad ship. 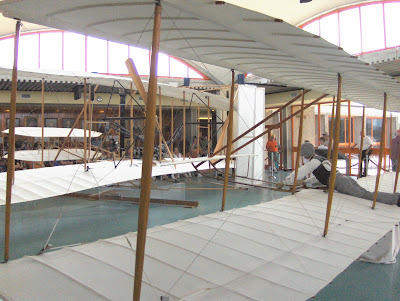 Tomorrow, we are off to visit Kill Devil Hills, where the Wright Brothers experienced their first successful flight. We are having wonderful time and wish you were here to join in the fun. Daddy D and I are having a wonderful time on our vacation. 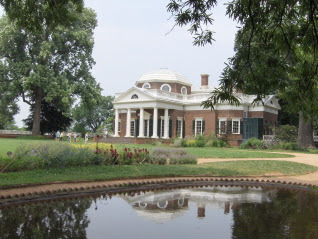 Yesterday, we visited Monticello, home to Thomas Jefferson, author of the Declaration of Independence. Jefferson was quite a fascinating fellow. Viriginia is a beautiful state. Today, we are off to see the Monitor in Newport News. For this Fun Monday challenge, and I do mean challenge, Swampwitch of Anecdotes, Antidotes, and Anodes has asked to see bookshelves and where we put things out-of-sight when company comes. For me this Fun Monday exercise is the most intimidating because Swampy has asked to see what we normally hide. So with great fear and trepidation, I will show some of our bookcases and my hide-stuff-from-the-guests places. I have decided on an abbreviated version of this Fun Monday for a few reasons. The main reason is that we are currently on vacation in Virginia. Second, if you have seen one of our bookcases, you have seen them all. Third, the same is true of our messes. If you have seen one mess, you have seen them all . This is our living room bookcase. The furniture is Ethan Allen that belonged to my parents. The door in the left of the picture opens to a closet where I store bedding for our fold-out couch, and the top shelf has cleaners and poisons hidden from guests and small children. There is another closet in the living room that holds coats, games, a vacuum cleaner, photos, and old vinyl records. Moving on to o ur basement, which is partially finished, meaning that there is wood paneling on the walls, and the concrete floor is uncovered. Our basement houses a variety of things including the washer and dryer. When our sons were young, we used part of the basement as a family room. As they grew to adulthood and moved out of the house, we turned one bedroom into a family room, and the other bedroom is our computer room. The basement became a room for storing stuff. You undoubtedly notice the cheerful Christmas stockings decorating this bookcase. You may be thinking, "Oh, this picture was taken at Christmas." Nope, the picture was taken last week in preparation for Fun Monday. Do NOT be frightened for what you are about to see. If you turn 90 degrees to the right, you will see this horrific mess. Before you think that I am a horrible slob, which is probably true, there are reasons (excuses) that the basement is so messy. One is that the basement leaks or seeps water when we have torrential downpours, which happens about once a year. Thus, things are quickly moved off the floor during storms. Another reason is that the basement is storing a few things for other family members. The third reason is that some of the mess comes from stacks of clothing and coats that are waiting to washed for two giveaways at our church. So there is a glimpse into my methods of storing stuff. As you can see, I am more like Ambrose Monk than his brother Adrian Monk. Ambrose stores all kinds of valuables or most would call it crap. Visit Swampwitch to see how other people display what they want people to see...and what they do with the other junk. Daddy D and I will be leaving soon for a vacation in Virginia. This is a vacation that we have been postponing for a few years. You maybe asking yourself, "Why in the world would these folks postpone vacations for years?" Or maybe, you might say, "Why in Sam Hill would these guys put-off vacations at all?" Or maybe, You might say... Oops sorry, I am getting carried away with another train of thought. Daddy D and I do go on day trips and weekend excursions as well occasional educational conferences, but sometimes the big trip alludes us. In fact one vacation , we actually postponed for 30 some years. In 1970, we vacationed in the Upper Penisula of Michigan. That year, at Whitefish Point, which is on the shores of the deep blue Lake Superior, we vowed to return within in a few years. The few years ended up being 35 years later. Do not be sad for us. When we did return, we had a wonderful time and stayed in Bed and Breakfast Lighthouse Quarters right on Whitefish Point. Here are a few pictures of the trip to the UP, then I need to pack. We are going to Virginia, and then on to the Outer Banks Swampwitch of Anecdotes, Antidotes, and Anodes is hosting the next Fun Monday for June 25th. Here is her challenge : Post pictures of your BOOK shelves (other shelves are welcome too: toy shelves, collection shelves, any shelves) AND post pictures of the inside of your garage or any place where you lock the door when company comes so they can't see the clutter. Rule: Don't clean it up first. If this intrigues you, visit Swampy, and sign-up for the next Fun Monday. Good news, the wonderfully creative Swampwitch of Anecdotes, Antidotes, and Anodes has agreed to host the next Fun Monday event on June 25th. Thanks Swampy. Here is Swampy's assignment. "I can learn a lot about a person by looking at their bookshelves and garage, or carport, or storage house... i.e. places where you store things." Swampy doesn't know who said this, so if no one knows, she'll take credit for it. This quote is not to be confused with Plato's quote: "I can learn more about a person in one hour of play than in one year of conversation." If you are like me, you cannot wait to show the world your messy closets so hurry to Swampwitch's place Anecdotes, Antidotes, and Anodes to sign-up for the next Fun Monday challenge. The very talented Wendster has posted a few more wall hangings. Go take a look, you will glad that you did. Have you signed up for the next Fun Monday assignment? Sign-up at Anecdotes, Antidotes, and Anodes. On June 12 and on June 15, I displayed two different bird pictures. Both of these pictures were taken in our backyard grape vine. The picture was taken after Daddy D and the preacher's daughters found the little bird amongst the baby grapes. 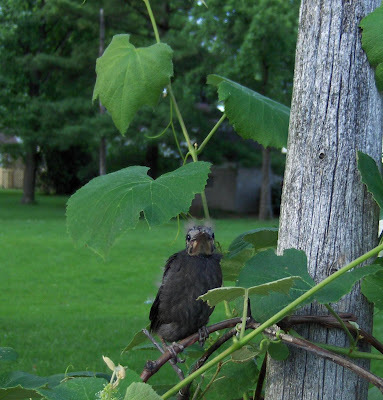 When I went out to see if the bird was still in the grape vine, the little bird seemed like he was posing. Pleased with my good fortune of capturing a nice bird picture, I went out a few days later to photograph our little bird again and found the bird in the second picture. Since the bird was in the same location and sat still to have his picture taken even though the plumage was different, I naively thought that this might be the same bird with adult plumage. At that point in my mind, both bird pictures were of the same bird and something different than a robin. Then three people, my lovely sister-in-law, REM, Pamela of Dust Will Wait , and Gawilli of Back in the Day who seem to know birds better than me, questioned my implication that this was the same bird. Originally, I did think that the first picture featured a robin. My error came in thinking the the bird in the second picture was the same as the first. Since these three bird enthusiasts pointed me in the right direction, I consulted with some experts at Cornell Lab of Ornithology. The bird experts confirmed what my friends suspected, that these are two different birds. The first picture is an American Robin, and the second baby is a Common Grackle. Now is that as clear as guano? I am sorry blogging world for the misinformation about our avian friends. I thank REM, Pamela, and Gawilli for their insight. However, I am somewhat embarrassed by my error. Not only, do I teach science, but my degree is actually in biology. Moreover, I have partially completed a correspondence course in ornithology. Finally, I call my blog, Return of the White Robin. Hopefully, if I ever see a white robin, I will be able to recognize the bird...Sheesh. Here are some new entries for Fun Monday on June 18. Bichonpawz - had computer trouble but is up now. I have looked forward to being able to host a Fun Monday event. Now, that school is out, I have a little more time. For this challenge, you have been asked to show us something that hangs on your wall that is fun, interesting, endearing, sentimental, or otherwise enticing. Select the picture of Uncle Horace, Grandma Galt's needlepoint, or little Susie's first fingerpainting to show the blogging community. However, in creating this challenge, I did not stop to think about some of the technicalities of this wall hanging Fun Monday. If your keepsake is something in a frame with glass, the glass reflects the camera flash and your lovely treasure is obscured. Hopefully, you have not had a great deal of trouble in taking pictures of your Fun Monday items or you may be wanting to hang me. To alleviate the light reflection problem, I have scanned some of my treasures, but the scanner does not scan the larger items. My first exhibit is a gift that my mother gave to me when I began my teaching career. 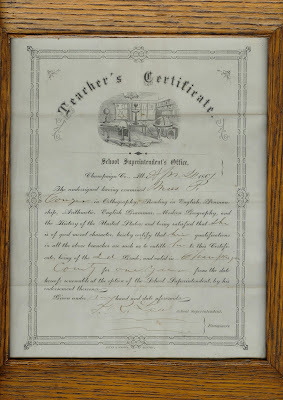 This is my great-grandmother, Pamelia Conger's teaching certificate dated April 24, 1869, which is about 100 years before I started teaching. I treasure this family heirloom, and the certificate itself is much nicer than my actual teaching certificate. 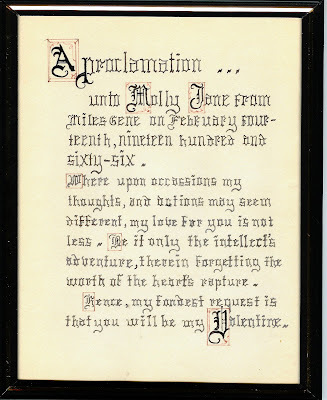 The next is a Valentine that Daddy D made for me when we were dating in 1966. Isn't he romantic? 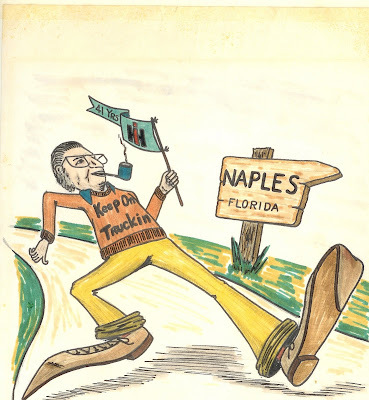 This caricature of my Dad was given to my Dad on his retirement from the International Harvester, where he worked for 41 years. After he retired, my parents moved to Naples. One of Dad's co-workers created the cartoon, and all of the people in his department signed the back. The picture hangs on my wall in a very nice frame with a maroon matting. 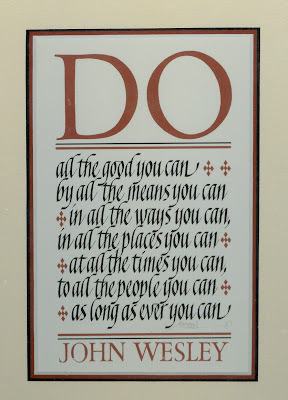 This framed quote by John Wesley is from my sister, Margaret. This is one of Daddy D's favorite sayings. The advice from Wesley certainly is sound. 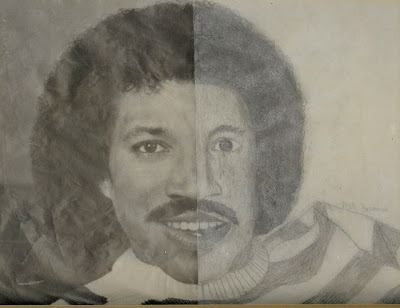 The picture of Lionel Richie was a sixth grade art assignment for our oldest son, Dean. In this assignment, students were to complete the second half of a black and white photograph in pencil. I think that the picture is wonderfully done. Luke, our second son, had a comic strip published in Purdue's student newspaper, The Exponent. Comic strips are typically drawn at a larger size and then are reduced to fit the newspaper. This framed strip is one of Luke's originals. 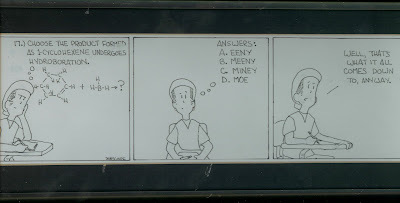 In this strip, one of the main characters, Cosmo, is taking an Organic Chemistry test. Daddy D teaches chemistry so he especially likes this particular strip. This friendly little gate hangs in our blue kitchen. My husband's step-father made this gate; I believe out of old siding. George was an interesting fellow and an inventor of sorts. He was forever making things out of stuff other people threw away. He made the most beautiful oak kitchen cabinets out wood from the interior of an old building. This wooden clock was made by one of my former students in his high school industrial arts class some twenty years ago. Last spring this former student, Caesar, stopped by school for a visit with his wife and pictures of his new baby. The teddy bear tucked inside the clock is one that I had as an infant. This same teddy bear was also loved by our two children when they were very young. 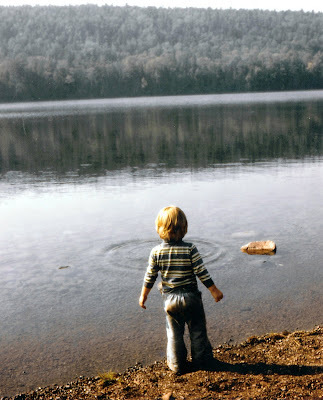 On a quite memorable occasion, shortly after we brought Luke home from the hospital, newborn infant Luke was crying, and his almost three year old brother said, "Don't cry baby, here is my Teddy." This was the same bear that his daddy had to retrieve before bedtime from our friend's house, who watched Dean during the birth of Luke. This is the kind of memory touches a mom's heart. So those are some of my treasures that hang on my wall. There is list of other Fun Monday participants in the margin on the left. Go visit those folks, and see what they have chosen to show us. Thank you for your visit and participation. I hope that photographing your hanging wares was not too difficult. Interested in next week's Fun Monday. See Friday's post. Things are moving forward for the next Fun Monday on June 18th. So far, we have 34 participants that have agreed to show us some of their treasures. For our challenge, I am asking that you show us something that hangs on your wall that is fun, interesting, endearing, sentimental, or otherwise enticing. Select the picture of Uncle Horace, Grandma Galt's needlepoint, or little Susie's first finger painting to show the blogging community. The list of participants is in the margin to the left. If you would like to join us or if I have omitted your name, let me know in the comment section. See you on Monday. If you like to do your homework ahead of time, here is Swampy's assignment. "I can learn a lot about a person by looking at their bookshelves and garage, or carport, or storage house... i.e. places where you store things." Swampy doesn't know who said this, so if no one knows, she'll take credit for it. This quote is not to be confused with Plato's quote: "I can learn more about a person in one hour of play than in one year of conversation." Post pictures of your BOOK shelves (other shelves are welcome too: toy shelves, collection shelves, any shelves) AND post pictures of the inside of your garage or any place where you lock the door when company comes so they can't see the clutter. Rule: Don't clean it up first ! 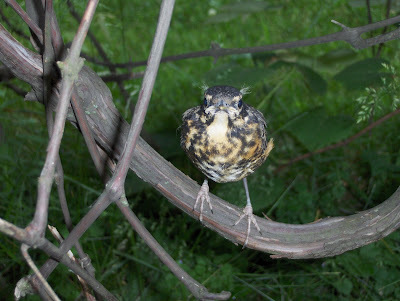 For Wordless Wednesday on June 13th, I posted a picture of a juvenile bird. Originally, I thought that this was a young robin. However, a few days later, I returned to our small grape vine and found this. Hello, I am guest posting today at Sunshine's And the Pursuit of Happiness blog. Come over for a visit, and leave a comment. You know the delightful Sunshine. She hosted the original and fantastic virtual Blog Prom in May. 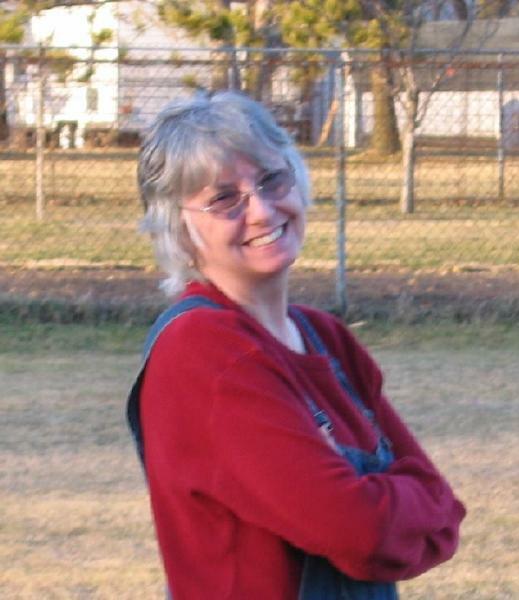 If you have not met Sunshine, you should pop over to her blog and get acquainted. While you are visiting, read today's post, "Looking for My Man", written by yours truly. Leave a comment and let me how I did with this guest posting assignment. Fun Monday News for June 18th. I have the honor to host the next Fun Monday on June 18th. For our challenge, I am asking that you show us something that hangs on your wall that is fun, interesting, endearing, sentimental, or otherwise enticing. Select the picture of Uncle Horace, Grandma Galt's needlepoint, or little Susie's first finger painting to show the blogging community. The list of participants is in the margin to the left. If you would like to join us or if I have omitted your name, let me know in the comment section. See you on Monday. Joy of A Spot of T is hosting this week's Fun Monday. Joy has asked us to show our kitchens. If you want to see kitchens from around the world, hurry over to Joy's to see the list of participants. I think you might have the chance to see at least 30 kitchens. My kitchen is nothing special with no special appliances, but you know that it is part of our home. Daddy D and I have lived in this house for 35 years in a large town in northern Indiana. 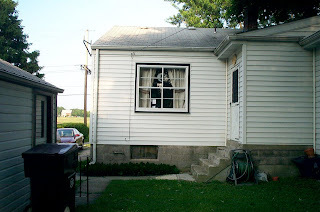 When we moved in, the house was a one story home with 2 bedrooms and 1 bathroom. This home that was built in 1950 had a kitchen with 2 orange walls and 2 kitchen-themed wallpapered walls. The floor was some kind of sprayed flooring that looked like splattered paint. 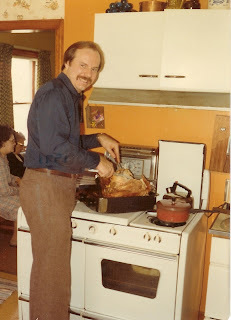 Of course, in those 30 some years, there have been many changes in our kitchen. At one time, the walls of the kitchen were yellow. Yellow may be my favorite kitchen color. Yellow like sunshine is so cheery. Currently, the kitchen walls are blue, a very bright sky blue. One summer Daddy D and I replaced the kitchen flooring with ceramic tile. Although this picture was taken recently, the taupe-colored tile is shown here. 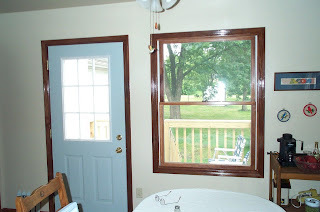 A few years after installing the ceramic tile, we did another renovation including replacing a big window with a smaller window and a back door. The original back door lead directly to the basement stairs, which was somewhat hazardous. Now, the back door to our home opens into the kitchen. This picture shows the previous book door entrance. 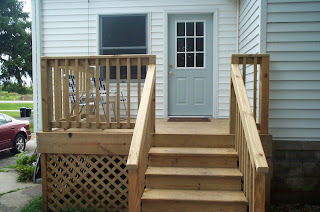 The small back porch is now a pantry.The next picture features the newly installed window and kitchen door that replaced the 16-paned window. Other changes in our kitchen included a new sink, faucet, and counter top. The counter-top is reminiscent of decaying leaves. I realize that decaying leaves in your kitchen may not seem aesthetic to you. But this stuff is appealing to two science teachers. 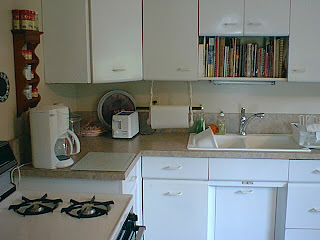 One thing that we did not replace is the old white-painted metal cabinets. Daddy D, who is a rather talented homeowner, has renewed the old cabinets with Rustoleum spray paint and new door handles. Essentially, our kitchen is rather simple. We do not have a dishwasher or a utility island. In earlier days, the kitchen was center of activity in our home. In addition to cooking and eating, our children would play in the kitchen. When friends came to visit, the children spend hours at the kitchen table coloring, playing with Play-doh, or creating other projects. Thus, although kitchen is not streamlined and modern, our kitchen is place of fond memories. I have the distinct honor for hosting Fun Monday for next week on June 18th. For the next Fun Monday challenge, show us something that hangs on your wall that is fun, interesting, endearing, sentimental, or otherwise enticing. Select the picture of Uncle Horace, Grandma Galt's needlepoint, or little Susie's first fingerpainting to show the blogging community. If you wish to participate in Fun Monday on June the 18th, leave me a note in your comment. Inherent in the claim, "Things are not like they used to be," is the implication that going back to an earlier, simpler time would be preferable to living in today's world. Of course, that specific notion is impossible. Furthermore, I assert that returning to the past would not be desirable. Granted horrific things happen daily, but the past is filled with a multitude of injustices. In our own country, land was taken from the natives, Japanese American citizens were interned, a race of people were enslaved, and African-Americans were denied access to housing, education, and the right to vote. Maybe the past has been difficult, and the present is problematical. In thinking about evil in the world, one might be tempted to give up and throw in the towel. What should we do instead? Of course, you know the answer. We need to stand up for fairness and justice. We need to right the wrongs that we can. By attempting to move ethically and morally forward, we help humankind. Maybe we cannot cure all of the ills in the world, but giving up is not an option. I am encouraged by the efforts of many young people. For example, two youths, Nick Anderson and Ana Slavin, were highlighted for good works on the evening news. Nick and Ana started a national campaign called Dollars for Darfur. These two high school students began a campaign to raise money to help Darfurians. 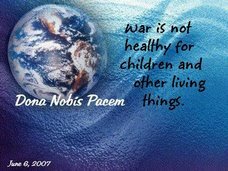 In another instance, this past week, Mimi Lenox, organized a Blogblast for Peace, in which Peace Globes and entries about peace were posted throughout the blogging community. Mimi, Nick, and Ana represent people devoted to building a better day and a better tomorrow. People like this give us hope for the future. People like this give us courage to do better. People like this have not given up on the today's world, and I will not give up either. 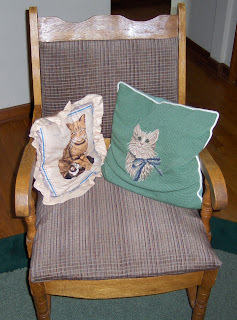 Although I am not a seamstress, I have sewn a variety of items throughout the 35 years in this house. When our sons were little, I created many Halloween costumes including a king outfit with a green poster board crown trimmed in gold and a kingly black robe with matching gold trim made from an old pair of my black velvet pants. Moreover, I made a Bat Robin costume, a fake fur bunny costume, and these two Stars Wars costumes among others. Being children of the seventies, our sons were avid fans of the trilogy. 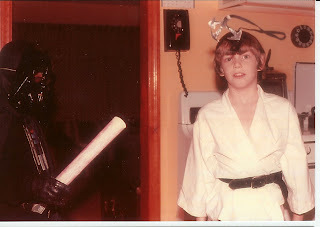 Luke is pictured in the Vader costume, and Dean is playing young Skywalker with the cool grappling hook, which was made by the creative Daddy D.
One year before Christmas when we were a one-salary family, I made a number of inexpensive plastic needlepoint items for gifts. Not only did I stitch the items, but I lovingly designed each gift to fit the recipient. Because the execution of the needlepoint is time-consuming but not at all challenging. I spent hours and hours watching daytime television. (Maybe in those days, Erica of All My Children was with husband number two. Was that Philip somebody?) Most of the presents were address book covers, but featured here are two tissue box covers. The one has an obvious space theme. The other features an apple tree with a different season on each panel. I am somewhat proud of my non-crafty self being able to make the French knots on that spring apple tree. Admittedly, the space box is a little dorky, but my parents appreciated this gift from their 28 year-old baby. The table pictured here is one that I damaged by using the table to hold potted plants. I love this old school table that Daddy D and I purchased for a few dollars at a school auction in the early seventies. Those of you that actually are knowledgable about furniture and antiques might be alarmed that I used bleach as well has heavy gauge steel wool to remove the ugly black circles left by the aluminum pie pans that were used as drain pans for the potted plants. I do rather like the results. Since both Daddy D and I both teach in this school system, we treasure this table, which in one of the drawers has a former kindergarten teacher's name, Kemper, written in crayon.